UN Special Envoy Martin Kobler and former Tanzanian President Jakaya Kikwete, the African Union’s High Representative to Libya, have joined Arab League Secretary General Ahmed Aboul Gheit in Cairo today for a trilateral meeting aimed at streamlining policy on Libya between the three bodies. The plan is that the three bodies will work together on efforts to break the current political logjam and promote dialogue between the various parties, particularly in obtaining international and regional support for the Libyan Political Agreement. Today’s meeting following approval in principle on closer collaboration at a meeting last month during the UN General Assembly in New York and then last week at the neighbouring states’ meeting in Niamey, Niger. 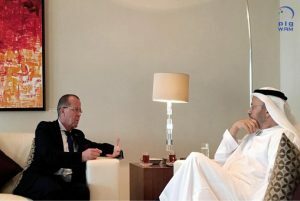 Kobler flew to Cairo from Abu Dhabi where yesterday he briefed UAE Foreign Minister Anwar bin Mohammed Gargash, on the latest efforts to promote the political process in Libya. Restating the UAE’s full support for UN-mediation efforts and for the Presidency Council, Gargash called for a solution that “would include all Libyan parties”, according to the UAE news agency WAM.